Welcome to my Kitchen for the month of November. I don’t know about you, but I can see, smell and feel Christmas from here. Tis only a Reindeer pellet throw away. I adore Christmas and everything to do with the season. I feel instant cheer when I see Christmas decorations, when I hear Christmas carols, and when I think of the food I’ll make and consume over the festive period. I can’t wait to see all my extended family, and I spend weeks thinking of ways to make it as enjoyable as possible for all my close friends and family, to extend the welcome to my home, to create new traditions and to make as many life long memories as possible for my kids. Quite frankly, stick me a white faux fur trimmed red velvet skirt suit and I’m Mrs Fricken Clause. In my kitchen this month, you may notice a theme. 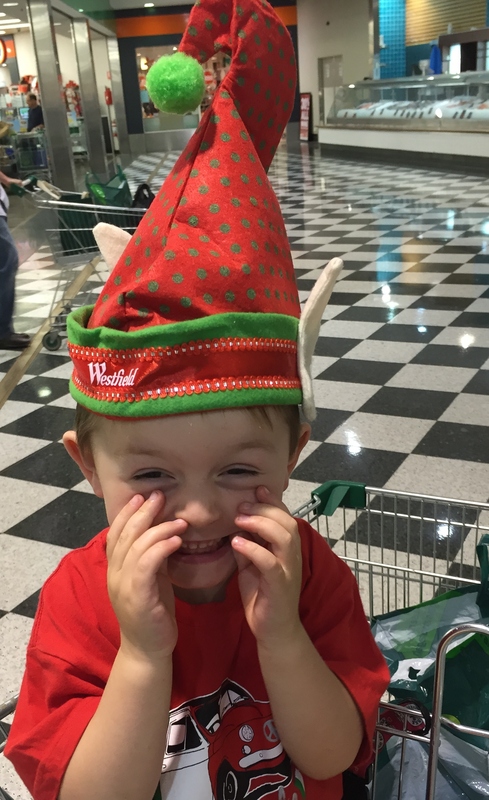 Buddy, my cheeky little elf after visiting Santa and high fiving him. Progress. 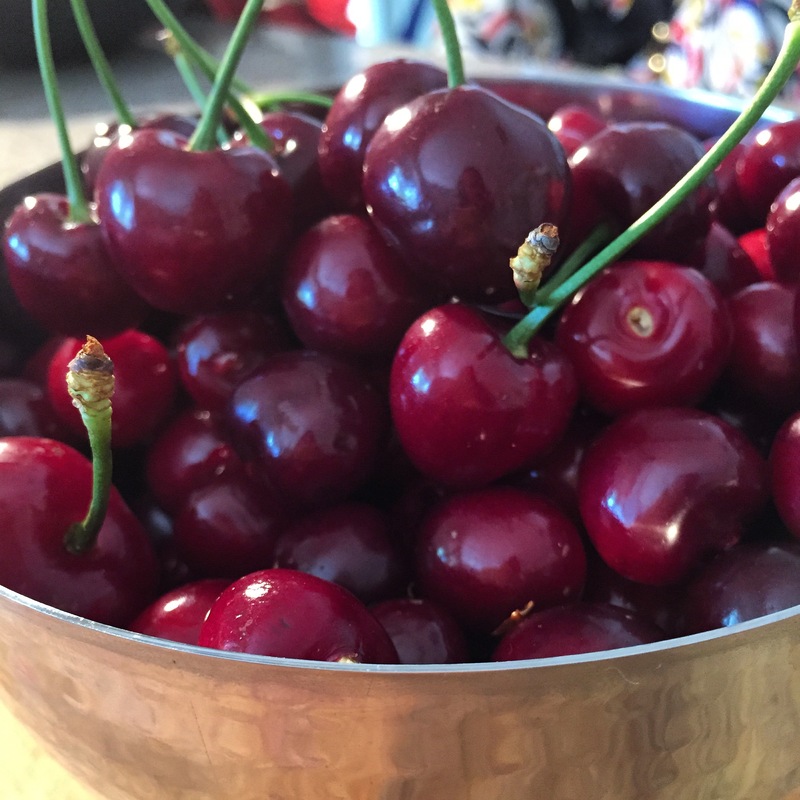 …is a big shiny bowl of locally grown cherries. Nothing screams Christmas louder to me than cherries. My grandma always had a bowl of cherries on her kitchen bench over the Christmas period and we would gorge on them until we were sick. Along with scorched almonds (that’s a reminder for me to buy some), chocolate peanuts and sultanas and red striped mint boiled lollies. Man alive, I’m going to miss her, this being our first Christmas without her. …is a lovely big bowl of Red Belly Citrus blood oranges. I did a post a ways back on these gorgeous globes, and low and behold another box showed up on Tuesday afternoon! What a surprise and a special treat. Thanks so much guys, my friends and family thank you for the glaze for their baked Christmas hams this year. …because I made a couple of jars of blood orange marmalade. The guys at Red Belly insisted it had to be a boozy marmalade, so instead of a traditional spirit added to the boiling mix, I added red wine. I thought that this would pair well together, as I love the two combined in a mulled wine, and I think it did. It’s much chunkier than a store bought marmalade, and will go brilliantly as a glaze for a baked Christmas ham. Lucky I have so many blood oranges as the first 4 jars have already been spoken for. …is a bottle of Gourmet Salted Caramel sauce, from the Aldi’s Gourmet range. It’s pretty darn good. Tweenie had a tooth pulled this morning in preparation for braces so I made her a salted caramel cashew nut thickshake, blitzing unsalted cashews with the milk and then adding lots of sauce and ice cream. Just what the Dr ordered I reckon. 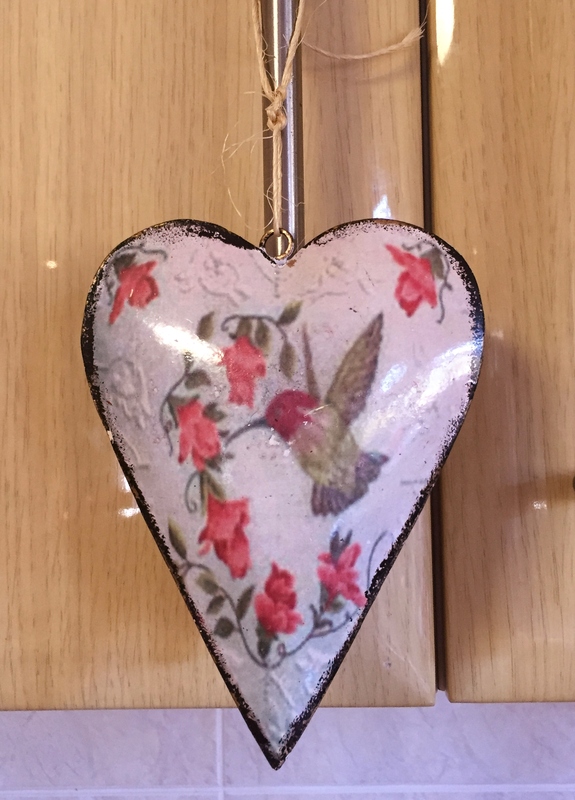 …is the most adorable tin love heart that Tweenie bought me at her school fete. She told me that it should hang in the kitchen cos that’s where my heart is. God bless her cotton socks, she’s such a sweetheart. …are a number of Christmas items I’ve picked up over the last week or so. I bought a red Christmas Pudding steamer, to team with the theme; a Christmas tree cake tin, how do you think a Christmas tree shaped Christmas cake would go? The cutest little Christmas spatulas, one can never have too many spatulas, don’t you think; a couple of packs of candy Christmas decorations for cupcakes and whatever else I bake; and a bunch of reusable wall decals. These shall go on all our windows. I may need more. 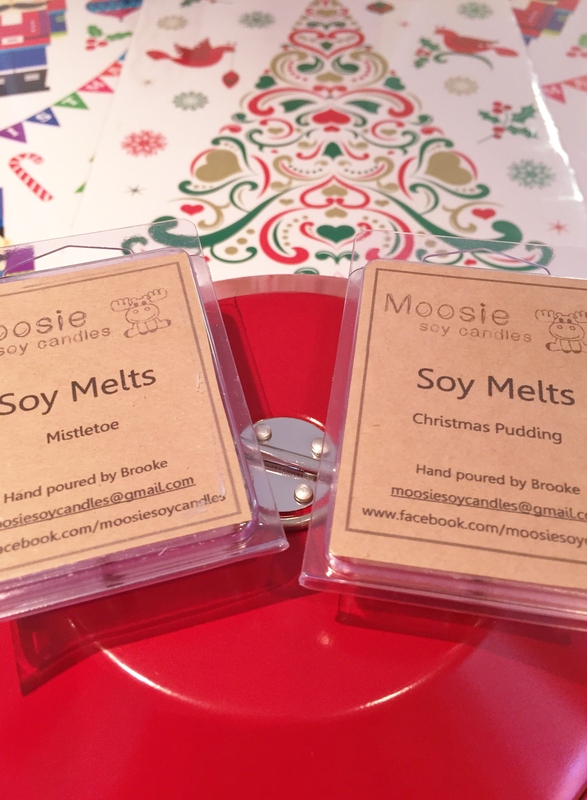 And a couple of packets of Christmas soy melts, Mistletoe and Christmas Pudding. At $5 a packet, handmade and each lasting up to 7 hours of burning, my house will smell like Christmas for an entire 6 to 8 weeks. SO is over it already. Bring it on, I say. 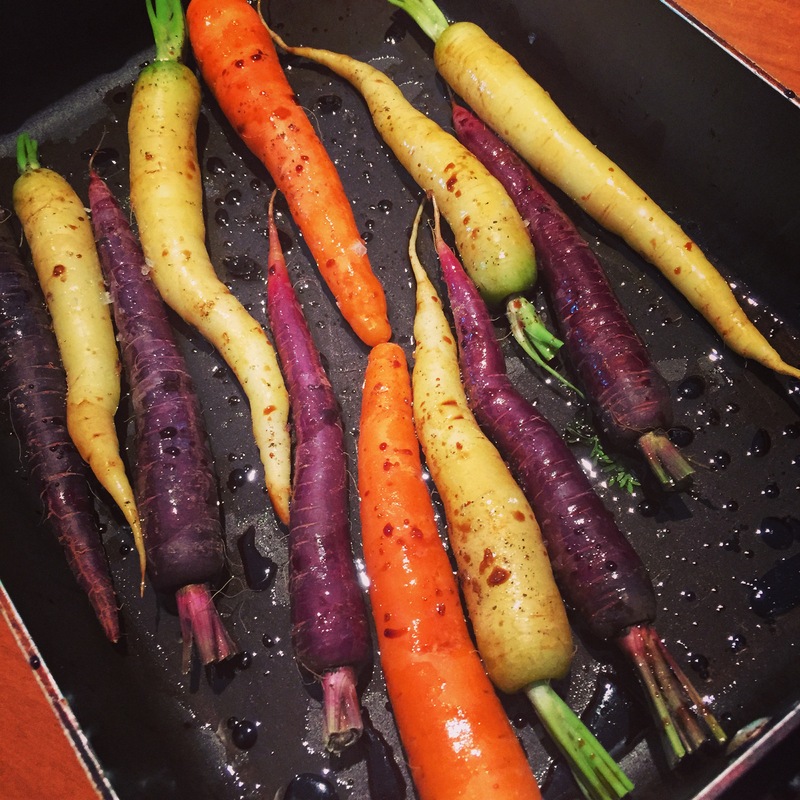 …finally are the last of a number of bunches of purple, heritage and orange carrots I bought at the Capital Region Farmers Markets. I paid $100 for a whole stack of fresh, local produce and will be doing a post on just exactly what you can achieve over a fortnight with just $100 of fruit and veg. I roasted these with some extra strong EVOO and balsamic vinegar, and they were so sweet, caramelised and full of flavour. Pity not a single one of the 3000 seeds that Buddy threw into the vegie patch in Autumn produced a single carrot. Oh well, maybe next season. Thanks for dropping by and checking out what’s in my kitchen. 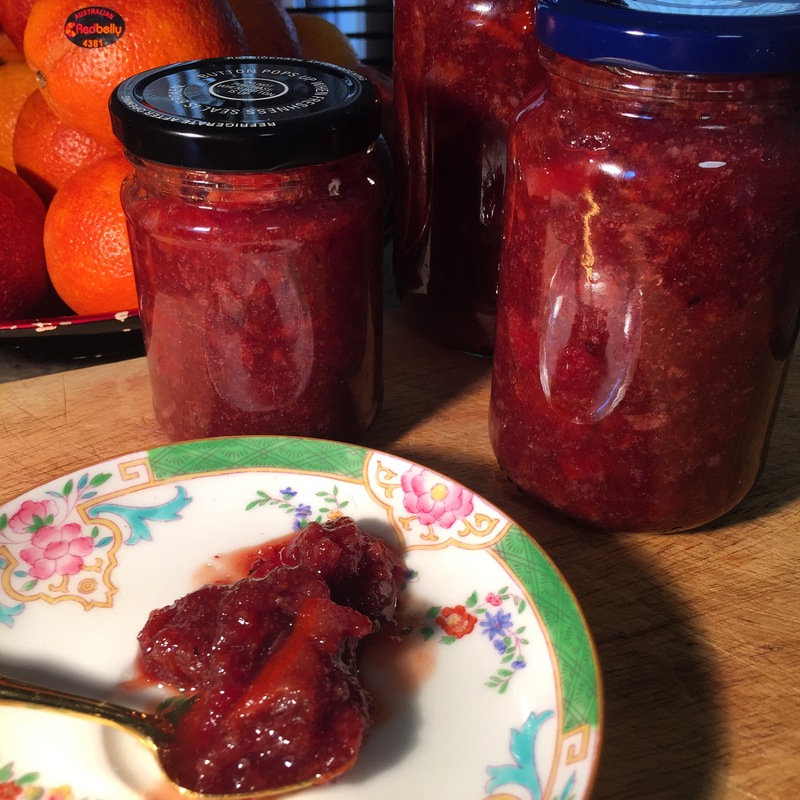 Head over to Celia’s blog Fig Jam and Lime Cordial to see what everyone else is up to. See you next month. December. Sqeeeeee, can’t wait. Previous Post A weekend of good food, good friends and close family. Grateful. 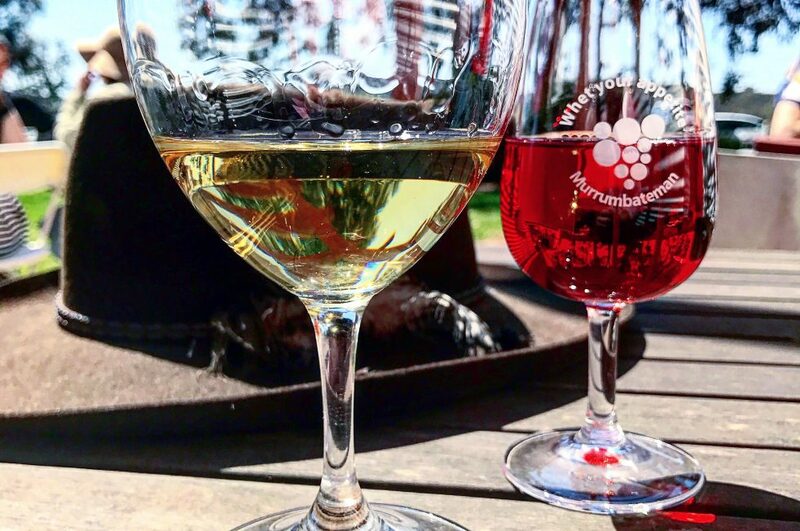 Love the cherry season… but then I love all the new seasons and the different fresh produce that they bring. It must be fun having Christmas on the way with young ones. I miss that! Liz, I think that’s why I’m so crazy for Christmas Cheer, the kids. Although, honestly, even when the kids are grown and gone I still see myself as that crazy old chick with ALL the Christmas stuff sprouting everywhere. I’ll be a Christmas Hoarder and they can do a show about me. So many good things happening in your kitchen this month! That marmalade sounds divine and I’m loving the new season cherries right now. How cute is your little man?! He is a little bit cute, but there are some days when he drives me insane! Good mixture of both? Hmmmm. I need more cherries so I can cook with them, without the kids eating them all fresh. Ooohhhh that blood orange marmalade, I can almost taste it! Christmas in your kitchen already, wow. We’re not far behind here in Houston though, but first Thanksgiving. Pumpkins, pecan pies, and roasting big birds, before the scent of cinnamon and mulled wine. Yes, Fran it is. Looking forward to your Thanksgiving posts. And your Goose! Hiya Colly Wobble 😊 I know how you feel, hubby is the all suffering Christmas Martyr. Or so he likes to tell everyone. You’re a long time dead, we might as well get as much enjoyment out of life while we’re here, eh? We must catch up for a flute of Christmas bubbles! By the way, if you have any blood oranges left, I made a marmalade with blood oranges, strawberry and rosemary – totally sublime!! 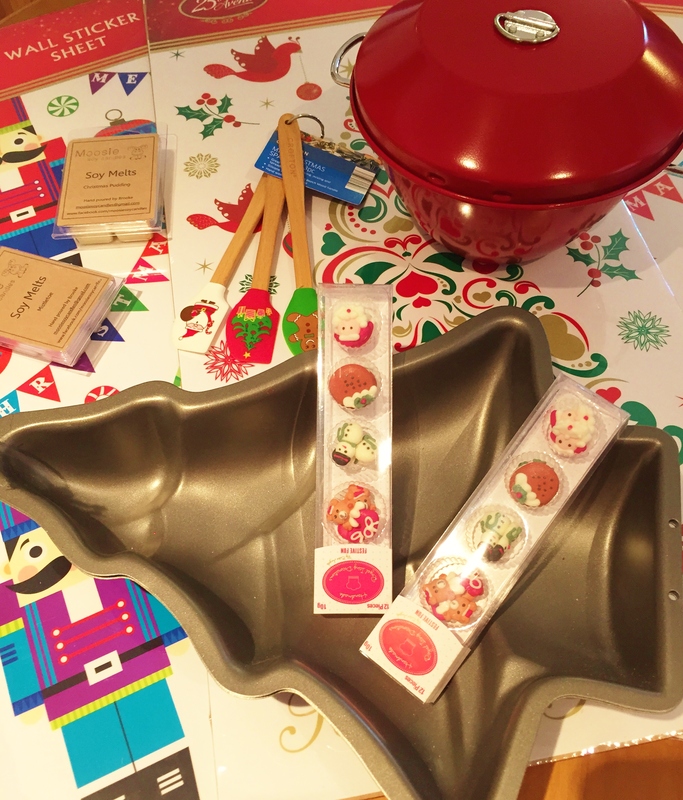 What a delicious array of Christmas goodies in your kitchen. I love the sound of those soy melts (I can almost smell them!) What a pity you won’t have your gran around this Christmas. I’m sure you’ll be raising a special toast to her. Thanks for your kind thoughts, Christine, I know she’ll be watching us all and keeping an eye on the proceedings, making sure the ham is sliced properly, the brandy custard is just right and the Christmas ckae cut Christmas Eve. I may just have to come over and do some of my X-mas prep with you Fran. Oh the fun and creativity we could have with some bubbles under our belts and a Carol or two chiming in surround sound. Alison, you absolutely must. Fun, fun, fun! Glad you’re on the Christmas hop, Celia 👍 Everyond needs a little more cheer in their lives, I reckon. Reds my fav colour and I appear to surround myself in it, all the time, be it in my kitchen, on my person or in soft furnishings. Love it. i like the look of your kitchen this month! love the cherries and the blood oranges. and your son looks so cute in his elf hat. that salted caramel milkshake looks wonderful. 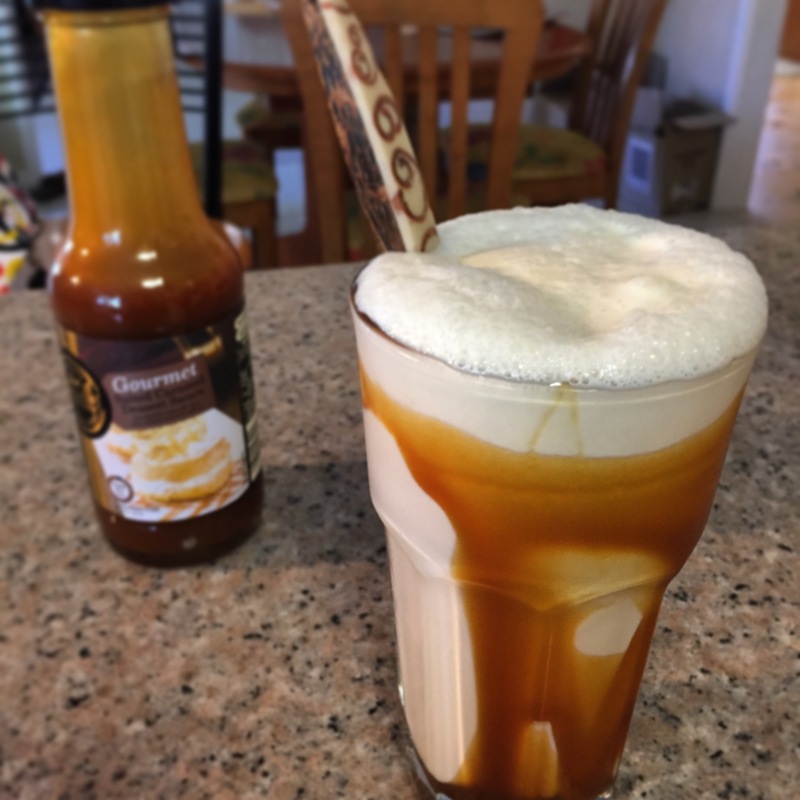 Thanks Sherry, it was another round of salted caramel thick shakes for all the kids this weekend, I really should make the sauce myself! It can’t be that hard, right? Can’t wait for cherry season to be upon us! Hi Fran, I look forward to your farmers market posts, I’m a total convert. How great are the guys from RedBelly, I love love their bloods! Yep, Jason, they’re awesome. Sadly none left though, I could cook so many more things if they were still in season. Love the farmers markets, but I’ll admit I sleep in too often I usually miss them 😦 Am not a morning person.